The first feature that you likely will use in your Microsoft® System Center 2012 R2 Configuration Manager implementation is inventory collection. Collecting hardware and software details provides a foundation that you can use with many other advanced features, such as application deployment. For example, you can use inventory details such as memory, operating system, IP address, or installed applications to identify clients that might need an upgrade, or as a basis for creating custom collections. To enhance standard inventory collection, you can implement the Asset Intelligence feature to provide additional data for reports and information about the software titles installed on specific clients. Inventory collection is the process of gathering information about the hardware and software that is installed on a client computer. You then can query this information, and use it as a basis for subsequent tasks, such as creating collections or generating reports. configuration of client computers. System Center 2012 R2 Configuration Manager supports hardware inventory collection for computers that are running Windows® operating systems, as well as Mac OS X, Linux, and UNIX. • Software inventory. You can use this method to collect information about files on client devices. NonWindows operating systems do not support software inventory. inventory, to report software installations on client computers. You can configure hardware and software inventory options in Default Client Settings, which applies to the entire hierarchy. You also can create custom client settings, and then assign them to specific collections to provide a more granular approach to inventory collection options. Custom client settings override any settings that you configure within Default Client Settings. Center 2012 R2 Configuration Manager supports hardware inventory collection for computers that are running Windows® operating systems, as well as Mac OS X, Linux, and UNIX. • Software inventory. You can use this method to collect information about files on client devices. Non-Windows operating systems do not support software inventory. inventory, to report software installations on client computers. You can configure hardware and software inventory options in Default Client Settings, which applies to the entire hierarchy. You also can create custom client settings, and then assign them to specific collections to provide a more granular approach to inventory collection options. Custom client settings override any settings that you configure within Default Client Settings. configuration or the type of installed software. administrative users with a specific collection, permitting them to perform tasks that you specify when you configure security roles. • Produce reports that display useful details regarding hardware configuration or installed software. inventory data that Configuration Manager collects for individual computers. This view is very useful when you are troubleshooting computer problems remotely. • Collect copies of files from client computers by using software inventory. Configuration Manager then stores these files on the site server. automatically. The following table lists the key phases in the inventory collection process. How Is Hardware Inventory Collected? When you enable the Hardware Inventory Agent, it runs on the client device and collects a broad assortment of hardware information. The client sends the hardware information that it has collected to a management point in the client’s site. The management point then forwards the information to the site server, which in turn submits the information to the site database. seven days. You can adjust the schedule, per your requirements. How Is Software Inventory Collected? specify, and then store them on the site server. Similar to hardware inventory, software inventory initially reports a full inventory soon after you enable the agent. Subsequent inventory reports only contain changes to inventory information. 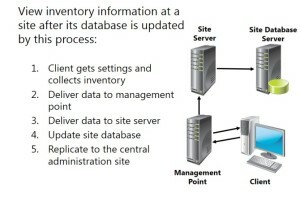 The site server processes delta inventory information, but rejects it if information is missing or corrupt. 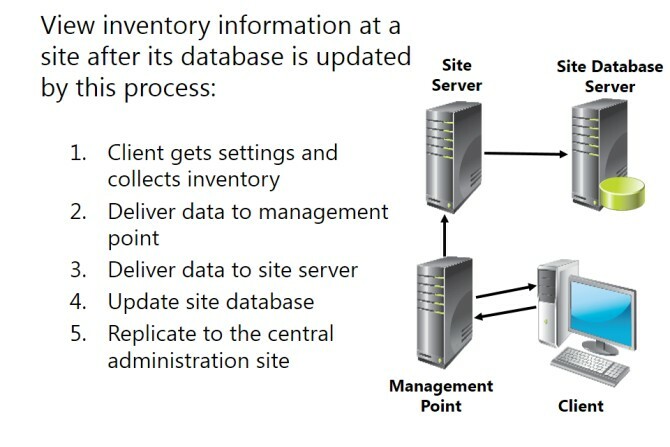 If the site server rejects the delta inventory, it instructs the client to run and report a full inventory cycle. You can use Resource Explorer to view inventory information for client software or you can view software inventory information in reports. modify this setting to configure a custom schedule, as necessary. System Center 2012 R2 Configuration Manager clients that are running OS X, Linux, or UNIX do not support the Software Inventory feature.